Yesterday, Microsoft showed a glimpse of what Windows 8 has to offer at the Build Conference. They demoed Windows 8 running on a Samsung Tablet. 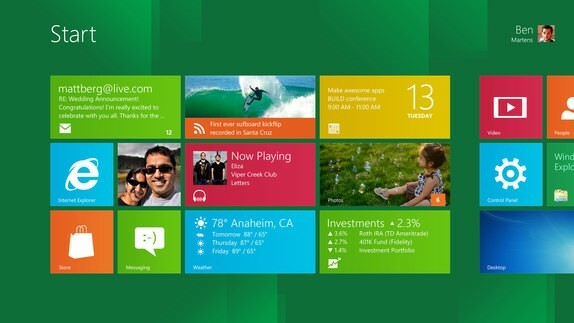 Windows 8 is inspired by Windows Phone 7 and it has also adopted the Metro UI. While the UI looks like it has been developed with touch interfaces in mind, it can also be used with a mouse and keyboard. Microsoft has also said that for those who prefer the traditional desktop, it will also be available as an application. Continuing with its demo of Windows 8 at the conference, Microsoft has actually released the Windows 8 Developer Preview for anyone to download. It is available for x86 and x64 architectures (32-bit and 64-bit). The x86 build is around 2.8 GB of download while the x64 build is 3.2 GB. An x64 build with the developer tools that will be required to develop Windows 8 applications is also available. It has a slightly larger download size at 4.8 GB. Click on the link below to go to the download page. If you have downloaded the x64 or x86 builds, you can do an upgrade from your previous Windows 7 or Windows Vista installation. To install the x64 build with developer tools, you will need to perform a clean install. Product activation is not required to run any of these Windows 8 builds. At this point we are not entirely sure, but we believe that its expiration time period is 6 months as is the case with the previous Windows pre-releases. According to Microsoft, the Windows 8 Developer Preview will run on any machine that can run Windows 7 and Windows Vista. Anyway, here is the detailed system requirement to run for Windows 8 Developer Preview. A touchscreen is not a requirement for running the Windows 8 Developer Preview - any system with a keyboard and a mouse will do. Remember that there is about a year left until the actual Windows 8 release. So, this is only a glimpse of what Windows 8 will offer.